Mount Prospect, IL – July, 15 2015 - Craig Van den Avont, President of GAM was invited by IMEC (Illinois Manufacturing Excellence Center) to participate in a roundtable discussion with the U.S. Department of Commerce Manufacturing Council’s Sub-Committee on Innovation and Research and Development. Hosted on May 28, 2015, this roundtable discussion brought together manufacturing leaders to highlight innovation in the American supply chain ecosystem and devise strategies for small manufacturers to identify and invest in innovation. 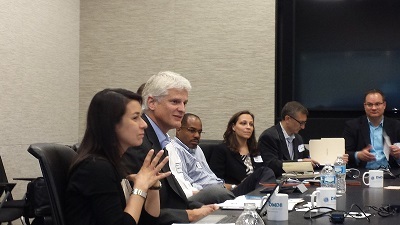 The meeting took place at the newly opened Digital Manufacturing and Design Innovation Institute (DMDII) in Chicago, IL. The DMDII facility was established to provide R&D assistance, innovative technology, and collaborative expertise to small manufacturers in the U.S.
Attendees of this roundtable discussed key points of the March 2015 Supply Chain Innovation Report, including challenges and benefits of innovating in the supply chain, relationships between small and large manufacturers, and initiatives to help small manufacturers increase research and development to improve the supply chain. Recommendations from these manufacturing leaders will be discussed further. This meeting follows an initiative released by President Obama on March 18, 2015, focused on building public-private partnerships to strengthen the small U.S. manufacturers that anchor the nation’s supply chains by providing access to potentially transformative technologies that will close the manufacturing gap in the United States. "I would like to thank all of the attendees for providing their insights and recommendations for the future of manufacturing in the United States,” said Craig Van den Avont, President of GAM. “It was an honor to join other experts in laying a framework for innovation among manufacturers now and in the future."